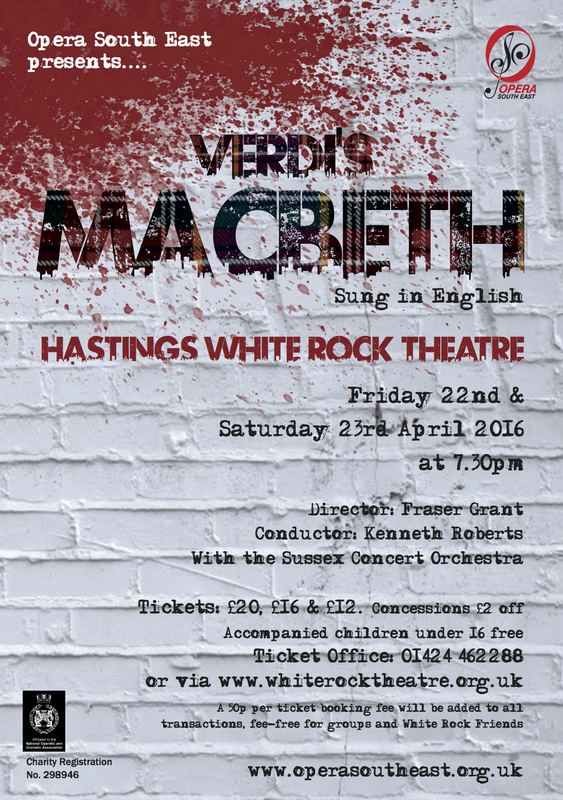 Opera South East will be performing Verdi's Macbeth with the Sussex Concert Orchestra at Hastings White Rock Theatre on April 22nd and 23rd, 2016 - curtain-up at 7.30pm. There will be a pre-show talk about Macbeth by the Artistic Director on the Saturday evening at 6pm for ticket holders on either night. Ticket from the White Rock Theatre at £20, £16 and £12, plus a 50p booking fee, concessions £2 off, under-16s FREE when accompanied by an adult. 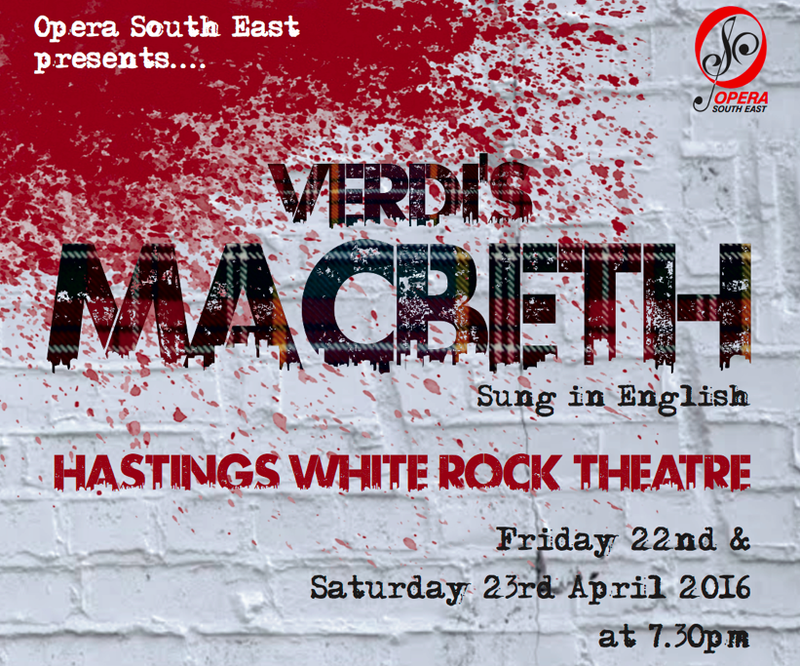 Opera South East are performing Macbeth, the opera by Verdi and sung in English, at Hastings White Rock Theatre on April 22nd and 23rd 2016, with the highly regarded Sussex Concert Orchestra under Conductor Kenneth Roberts. In this is a nightmarish dream, the production aims to highlight the destructive power of ambition as narrated by the Gaelic Chorus of Witches. The corrupt court of Macbeth will literally be torn apart. It’s not to be missed. The Artistic Director Fraser Grant will be giving a pre-show talk on the Saturday evening at 6pm to ticket holders of either performance. This coincides with the 400th anniversary of the death of William Shakespeare, 23 April 1616. Tickets from the White Rock Theatre at £20, £16 and £12 (plus a 50p booking fee unless groups of 8 or more). Concessions £2 off. Accompanied children under 16 are free. In this production we explore the dark and mysterious world of Shakespeare's play. The witches foretell the prophecy and the writing is on the wall. 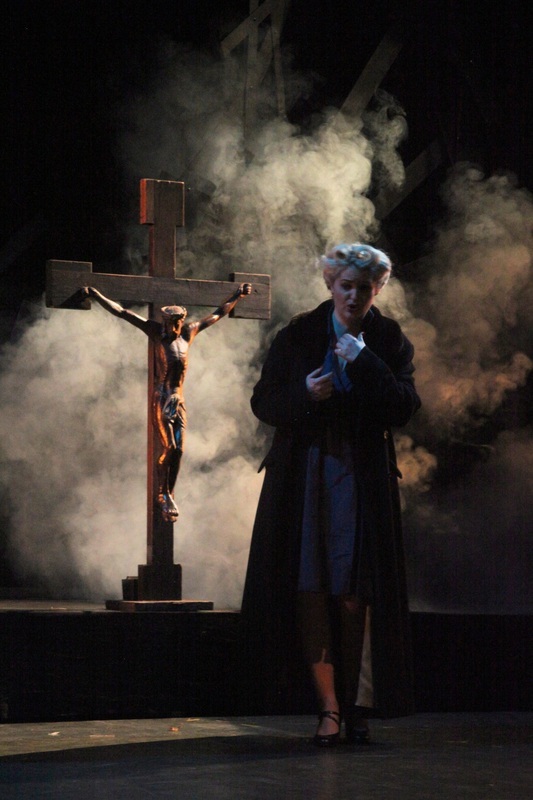 With its devastating mix of murder, witchcraft and political intrigue, Verdi’s opera of Shakespeare’s masterpiece has thrilled audiences for over a century. Verdi regarded Shakespeare as ‘one of my very special poets, and I have had him in my hands from my earliest youth, and I have read and re-read him continually.’ It is not surprising that Macbeth remained one of Verdi’s favourite own works, despite its comparative lack of success in his lifetime. This is a nightmarish dream, set in a dark void, somewhere between now and then. The production aims to highlight the destructive power of ambition as narrated by the Gaelic Chorus of Witches. The corrupt court of Macbeth will literally be torn apart. It’s not to be missed. 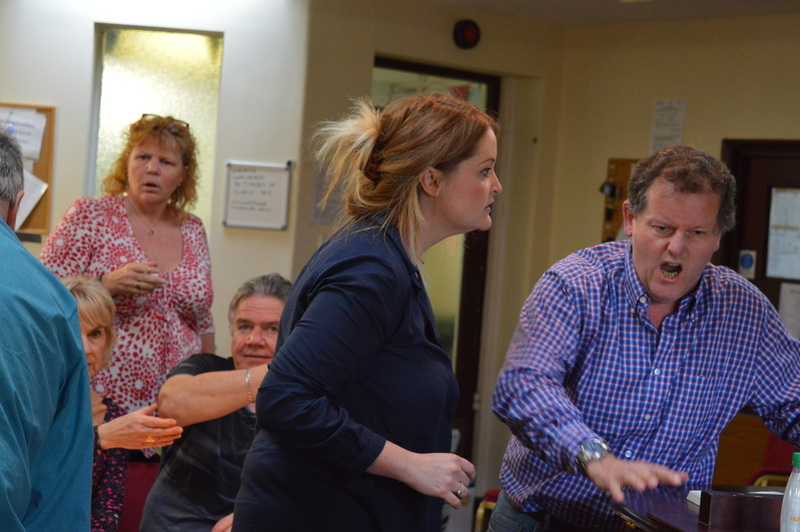 Key Principal roles are from Peter Grevatt as Macbeth, Richard Woodall as Banquo and Mari Wyn Williams as Lady Macbeth. Our final performance of Macbeth happens to be on the 400th anniversary of Shakespeare's death. 23 April 2016 commemorates 400 years since the death of William Shakespeare (23 April 1616). It also happens to be St George's Day - the 1713rd anniversary of the death of Saint George on 23 April 303. The Pre-show talk by the Director on the Saturday has proved a popular event in recent years and will give you an insight into how and why this particular production is presented in the way it is! We have been performing operas for 35 years (since 1980) by bringing together enthusiastic amateurs and emerging/established professionals to provide a unique opportunity for singers of all ages and backgrounds to experience the thrill of opera performance with a full orchestra. This will be Fraser Grant's 18th engagement with OSE as Artistic Director. We have been a registered charity for 27 years (1988 - link) to present fully staged operas in and around Hastings that are affordable and accessible to everyone, performing high quality productions in English to encourage new audiences. OSE enable emerging singers to gain valuable performance experience under professional musical and artistic direction. We present galas and concerts, lectures and workshops in order to strengthen our involvement with the wider community. We delight in introducing opera to new audiences, especially children (under-16s go free to all our productions when accompanied by an adult). Further history can be found on About Us and upcoming event info from Next Production pages. This poster may be downloaded and reproduced. Higher resolution version, and rehearsal photos may be requested.